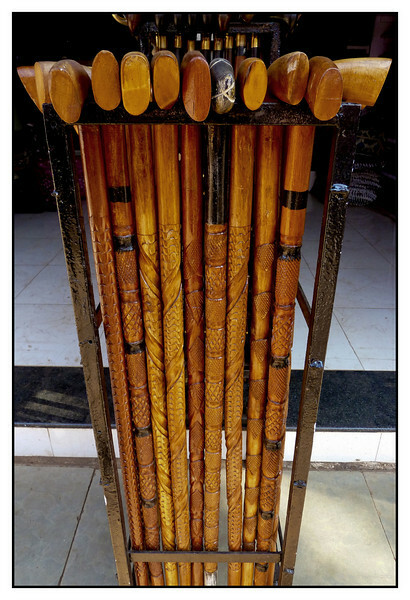 Handmade walking sticks for sale at Mahabaleshwar Market. Lovely shot of arranged walking sticks.. Very nicely composed. I love the carving and rich warm tones of the wood. Excellent comp -- love the symmetry and the warmth of the color. beautiful craftsmanship, very cool capture! Neat shot and walking sticks. Wonderful capture. The warmth of the wood with luscious shades of brown are so appealing. Save one for me. Wobbles are not too far off. My dad uses a cane. Having just the right one is important. These look lovely.